Airglow: A Halo Around Our Earth! When the sun sets, the sky slowly turns dark and the only light seems to come from the moon. But astronauts up in space enjoy a prettier view than what we see on Earth. Recently, NASA released pictures taken from the International Space Station, showing a mysterious planet surrounded by an orange halo. Surprisingly, this orange planet is none other than our planet Earth! Known as an airglow, these bands of light are generated in the upper layers of our atmosphere and stretch anywhere from 50-400 miles. Airglow is a phenomenon in our Earth’s upper atmosphere, more specifically the ionosphere. It is also referred to as dayglow, twilightglow, or nightglow depending on whether the sun is shining. Dayglow and twilightglow occur when atoms and molecules in the atmosphere absorb the sun’s radiation and move to an excited state. They release energy in the form of light. However, this light is not as bright compared to the sunlight we receive during the day and hence is not visible to us. At twilight, however, when the Earth's surface gets dark and the upper layers of the atmosphere are still illuminated by the Sun, the glow is visible. You may have seen a pale orange or pink glow across the evening sky at sunset -- this is twilightglow. Nightglow works a little differently because there is no sunlight to absorb during the night. Instead, molecules go through a process called chemiluminescence -- a chemical reaction that emits light. During the day, oxygen molecules (O2) in the atmosphere absorb the sun's radiation and break apart. At nighttime, they recombine into an oxygen molecule, releasing energy as visible light. Airglows can be seen in a variety of colors, such as the rare orange seen recently, or a green color as seen two years ago. Airglow is similar to auroras or northern lights, but there are some key differences. 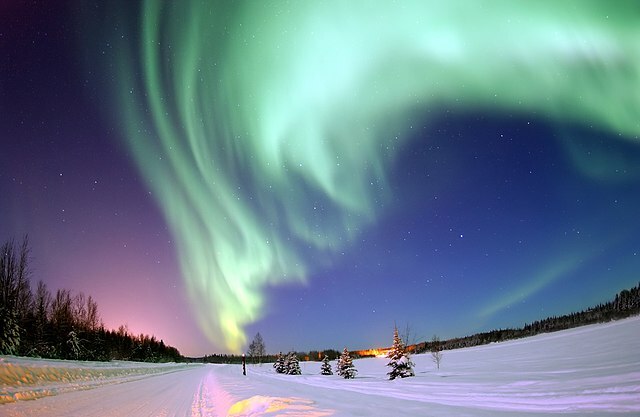 First off, airglow is emitted from the entire atmosphere of the Earth, but auroras can only be found at higher latitudes like the North Pole because they form along the magnetic fields of the Earth. The processes by which they form is also unrelated. While airglow is created after molecules absorb solar radiation, auroras form when charged particles shoot in from space and collide with gases in the Earth’s atmosphere. The collision causes the gases to give off light. Finally, auroras can only form if the charged particles rushing in are strong enough to create a large collision. However, airglow happens daily - we just do not see it happening. But when we do see it, it reminds us of just how many secrets of our planet we have yet to unfold.